In previous times German Chamomile has been known botanically as Chamomilla recutita and Matricaria chamomilla. Chamomile has survived the evolution from a world that used predominately herbal medicine to a world that relies predominately on biomedicine or laboratory derived medicine. Recognized today as an official drug in the pharmacopoeia of 26 countries, the flowers of Chamomile are still used much as they were hundreds of years ago.And what a useful and beautiful weed Chamomile is. 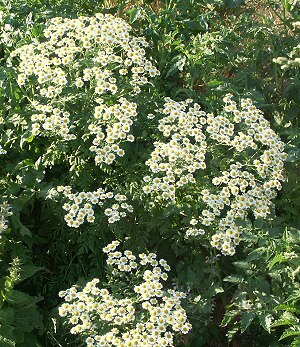 A fast growing annual, German Chamomile fills fields and rows with its dainty little daisies. These cheery little flowers with their apple like fragrance are most familiar for their contribution to our nighttime tea. The calming effect of Chamomile tea is legendary and is based in scientific fact. The tea can also be used cosmetically to bring out the highlights in your hair. Recently there has been some evidence that a preparation made with chamomile and applied externally is good for eczema and sore itchy skin, which seems odd because the fresh plant causes skin rashes on some people. 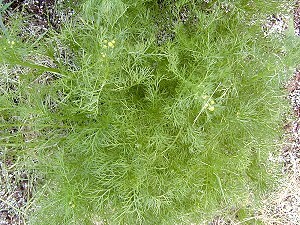 German Chamomile grows to about two feet. Chamomile flowers may be used fresh or dried and are best when picked the day they open. Flowers can be picked for several months. Leaving the last of the flowers to set seed usually allows the Chamomile to self sow the next year. In Herbal Healing for Women, Rosemary Gladstar recommends lemon balm and chamomile tea as the perfect way to relax after a stressful day. She also suggests these for headaches, depression and insomnia. For pregnant women, she advises it as a non toxic tea for allergy sufferers. What else does she recommend? Check out our review! 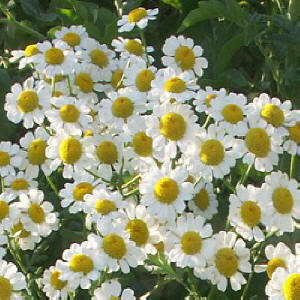 German Chamomile is one of the fun herbs included in our Kid's Herb Garden Six Pack. It also makes a great addition to our Tea Herb Garden Six Packs and our Small Space Herb Garden Six Pack. These plants are sometimes available in plug trays. These trays hold 128 of all the same plant. They are a great low cost way to fill a lot of space. Each cell is 3/4 of inch by an inch. Check here to see if German Chamomile Plug Trays are available.